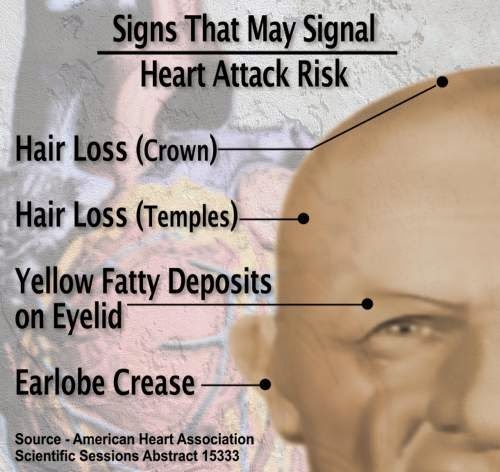 The Shocking Connection Between Hair In The Ears and Heart Attack.. If the eyes are the windows to the soul, then the ears are the windows to the heart. Science says that ear canal hair, that dollhouse garden of black strands inside many an ear, is a common signpost for heart attacks. 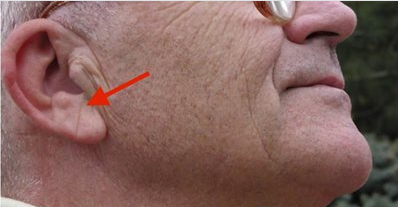 How the idea occurred to them is a mystery, but in 1973, Dr. Sanders T. Frank and his team of researchers published a study in the New England Journal of Medicine claiming that a diagonal earlobe crease, then nicknamed “Frank’s Sign,” was a positive predictor of coronary artery disease. CAD is a plumbing problem where waxy plaque deposits build up inside the arteries, a condition called atherosclerosis usually caused by too much ESPN exposure. Intrigued by this clairvoyant ear-heart connection, physicians partnered with dermatologists to find answers. In 1984, a group of New York physicians published a letter in the New England Journal of Medicine claiming a strong association between ear canal hair and coronary artery disease. In a study of 43 men and 20 women, 90 percent of participants who had both a diagonal earlobe crease (DELC) and ear canal hair experienced cardiac failure. Those physicians, including Richard F. Wagner of Boston University Medical School, suspected that long-term exposure to androgen, the king of male hormones and father of testosterone, caused clots in the arteries due to surplus production of red blood cells. Five years later, in 1989, an article appeared in the Indian Heart Journal in which the researchers published their conclusions from a study involving 215 Indian patients and correlations between earlobe creases, ear hair and coronary artery disease. “A significant difference was also observed between men with and without CAD in the presence of ear-canal hair with age matched group,” wrote the authors in the report abstract. Ear hair prevalence advanced with age. Not to be outdone by the 20th century, Edston E. published his study in the June 2006 edition of the American Journal of Forensic Medical Pathology. Edston studies 520 autopsies and measured the BMI, spleen weight, ear hair, earlobe crease, cause of death, baldness, thickness of abdominal fat, and a half dozen other characteristics. After crunching the numbers, “It was found that ELC (earlobe crease) was strongly correlated with CAD in both men and women (P < 0.0001) but with sudden cardiac death (SCD) only in men (P < 0.04).” The younger the patient, the higher was the positive predictive value. No one is quite sure why ear hair and heart attacks make good bedfellows. Some accuse testosterone supplements. Others think that as people age, they get hairy and overweight, and they die from the latter. Thankfully, no one blames ear hair.